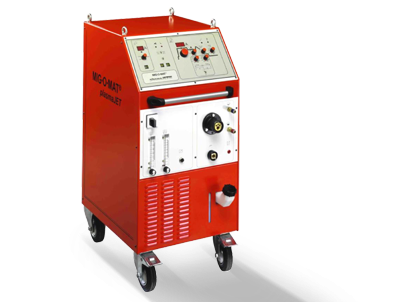 Especially for manual welding in a higher welding current range, particularly for plasma spot welding MIG·O·MAT plasmaJET 150 had been developed with a maximum welding current of 150 A in case of a duty cycle of 50 % as well as MIG·O·MAT plasmaJET 250 with a maximum welding current of 250 A in case of a duty cycle of 60 %. The control device is almost identical with the control devices of MIG·O·MAT plasmaJET 50 and MIG·O·MAT plasmaJET 100. The MIG·O·MAT plasmaJET 150 and MIG·O·MAT plasmaJET 250 are however not intended for microplasma-arc welding.